This conservation resource was created by Molly Dube; Simon Mattes; Matthew Wharrie; Arthur Woo. It is shared under a CC-BY 4.0 International License. Namibian administrative districts. By TUBS via Wikimedia Commons. GNU Free Documentation License. 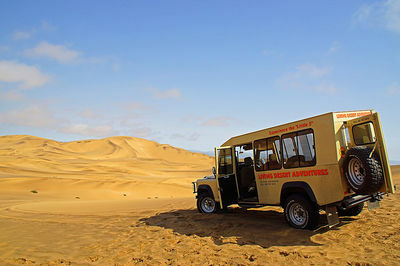 Namibia was inhabited by South African tribes until it experienced brutal colonization experiences first by the British in 1878 and later by the Germans in 1884 . Indigenous tribes such as the Herero were greatly affected. They were repeatedly pushed out of their territory, having to consistently re-locate and re-settle. They also endured the well documented German lead Genocide of the Herero and Nama people from 1904-1907. 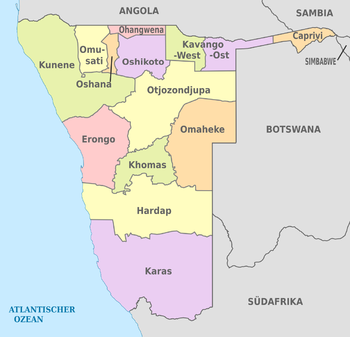 In 1878, the British occupied a small part of Namibia, Walvis Bay, and in 1884, the Germans proclaimed the Territory of South West Africa a German protectorate until 1915, which is when the South African pushed the Germans out due to consequences World War 1. The exit of European powers lead to periods of South African Military rule accompanied by an African nationalist movement, armed rebellions, and major issues of apartheid. Namibia would eventually claim independence in 1990 by electing its first president, President Sam Nujoma . In 1996, following independence, Namibia initiated its Community Based Resource Management Programme which was defined as “a combination of policy and legal reforms, which includes the granting of resource rights to local members of communal conservancies.” by the World Resource Institute in 2011. With the start of this program, Namibia exhibited its ability to allow its citizens to decide how their natural resources will be allocated and used. . In creating conservancy centric CBNRM programs, Namibia redistributed power and management via devolution to local communities through legal and institutional reform. However, the central government still plays a role in regulating and supporting conservancies. Namibia’s Ministry of Environment and Tourism is responsible for recognizing conservancies, and has the power to de-register them if they fail to comply with conservancy regulation. Government regulation at this level requires conservancies to have wildlife management plans, conduct annual meetings, and prepare financial reports. The ministry also sets quotas for hunting on conservancy land with assistance from Non Governmental Organizations (NGOs) and the local communities. NGOs influence the implementation of CBNRM projects in Namibia through the Namibian Association of CBNRM Support Organizations (NACSO) members, which include 8 NGOs and the University of Namibia. NACSO has 3 working groups that support communities and their conservancies. The Business, Enterprise, and Livelihoods Working Group assists conservancies to develop businesses and to manage joint venture tourism operations. The Institutional Development Working Group works to develop and improve conservancies' democratic governance, management and financial operations. The Natural Resources Working Group works with conservancies and government to gather, analyse and publish data on wildlife and other natural resources. Additionally, in Namibia NGOs offer strong support meant to provide non-biased international support to help transition power from federal management to local management levels. In Namibia as in many parts of the world, the indigenous people of the area experienced big changes in how their traditional lands were used, and how land ownership was determined after colonization. Lost cultural traditions and ways of life have contribute to a sense of disconnection to the land for many indigenous people in Namibia. When responsibilities and rights to traditional territory is returned, both communities and individuals regain a sense of connection and ownership that had been lost. Namibia is home to many of the iconic large mammals that live on the continent of Africa. Many of these animals are wide-ranging and human/animal contact is a common occurrence. 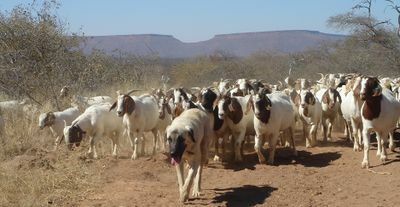 In the past Namibia has taken part in state sponsored culls, and currently the greatest amount of conflict arises in areas of heavy agriculture or livestock production. By providing financial opportunities that differ from these land uses, CBNRM's can help teach locals that maintaining a high level of biodiversity of all animals, and not just the large iconic mammals is beneficial for their communities and their country. CBNRM programs are notorious for their high rates of failure, particularly in early stages of development. Human, financial, and physical capital are often lacking in these projects, even when natural and social capital are present. Common underlying problems seen in CBNRM programs include financial mismanagement, natural resource mismanagement, high role-player turnover, political/economic changes, market changes, and top down developments. A Meta-analysis of 25 studies of CBNRM programs in Namibia found that 44% of studies observed negative impacts on social cohesion in participant communities. These negative impacts resulted from conflicts over conservancy formation, benefit distribution, and the decision-making processes that governed conservancies. In Namibia, conservancy governance often covers large areas of land and high numbers of people relative to CBNRM programs in neighboring counties, creating potential for negative social cohesion impacts as people have less localized control over aspects of the programs. The negative impact most reported by the Namibian CBNRM meta-analysis is human wildlife conflict, with 52% of studies reporting negative impacts while only 24% reported positive impacts. Human wildlife conflict has been reported as reducing access to physical infrastructure in the Kunene region as well as reducing income from agricultural production. Reduction in agricultural production lead to reduced household food availability in the Caprivi Region One example of a Namibian conservancy that was hampered by human animal conflict is the Kwandu Conservancy in the Caprivi region. This conservancy had rates of wildlife-induced crop and garden damage higher than anywhere else in Namibia. Human wildlife conflict lead to psychological harm to residents through stress inducing worries about physical safety. Food insecurity was experienced by subsistence farmers in the region, and investments lost through field destruction. Residents were restricted by conservancy regulations in how they could react to wildlife threats, and compounding the problem was a low ratio of game guards per farmer. Some limited compensation was available to residents, but it was not sufficient to cover their losses and often difficult to obtain. Given that poaching has been associated with areas where perceived livelihood risks are greater, human wildlife conflict could further undermine the conservation goals that CBNRM programs hold.. The impacts of Human wildlife conflict are compounded when experienced by already disadvantaged groups. In the Kwandu Conservancy, existing vulnerabilities related to poverty, culture, and marital status made woman more susceptible to wildlife impacts. Woman were less likely to be able to overcome food losses from crop damage since it is harder for them to obtain other sources of paidincome. Household income gains in Kunene region reserves were also reported as greater for male than female headed households under newly implemented CBNRM programs. A study of two models of CBNRM in Zambia, one village based and one area based, found that an average of 40% of income was misused at area level conservancies versus 0.8% by their village level equivalents. The four village level conservancies completed 150 conservation projects compared to 10 competed by the four area level conservancies. This study has negative implications for the effectiveness of Namibia’s CBNRM programs as they are generally more comparable to the area level conservancies found in Zambia, covering larger communities and not just small villages. The effectiveness of CBNRM’s as a poverty alleviation tool used to lift already disadvantaged members of a community out of poverty has been shown to have mixed results in Namibia. In the Caprivi region, economic gains were poverty neutral and not "pro poor" as many CBNRM programs are intended to be. Local communities, their members, governments, the ecosystem, and the wildlife within those ecosystems must all be considered when implementing a conservancy. There are two types of action that are considered; decentralization of power which shifts responsibilities to a lower arm of government, or devolution of power which removes power from the government and transfer the responsibilities to communities or a third party such as an NGO. In the case of decentralization, the government is left with a measure of influence and control. This can be valuable in areas where the government is not considered corrupt and is trusted by the people. It also allows for funding to flow in to the area from national, and regional levels. Devolution requires that communities take responsibility for managing the resources for which they are entrusted without the aid of government funding. This is often where NGO's act as financial backers and/or enter into a partnership with the communities to provide framework and support to properly manage the resources. Depending on the culture, social structure, political structure, economic health, and available technology of a location one or the other may be favoured. Before implementing either option the initial steps that are taken often will determine the success or failure of a project. There is no template that will work for every location, but there are actions in the planning process that can greatly increase a favourable outcome for all parties involved. First and foremost consultation with the local communities and individuals who will be involved in the area is imperative. Traditional knowledge of the geographic area, ecosystem, and wildlife that they possess is an important component that has been overlooked or often forgotten. Understanding the political structure of not just the country, and administrative region, but also the underlying political structure of the communities. If there are power dynamics that are not obvious from an outside point of view such as powerful families or organized crime these issues must be considered and planned for instead of attempting to correct them after the establishment of a conservancy. Distribution of power and authority must be modeled to benefit the greatest number of local people, and to reduce the possibility of corruption. Boundaries must be established both spatially, as well as for what is allowed to take place in the park. Can grazing of farm animals occur, harvesting of wild animals, timber, other native flora? Are there possibilities for tourism within the conservancies? What is the current state of the environment and wildlife populations and can sustainable harvesting occur? These are some of the questions that must be addressed when planning rules and boundaries. Lastly a dispute resolution process must be established that is both legally binding and accepted by all the parties involved. Once all these factors have been taken into account and all parties agree on the terms, only then can a conservancy be established. Following implementation continuous monitoring by a unbiased third party such as an NGO can provide valuable information on the level of success of the conservancy. The health of the ecosystem, of flora and fauna populations, and the wealth and power distribution within the communities involved are all areas where monitoring should take place. If there are deleterious effects in any area, corrective measures need to be established and implemented to ensure mutual benefit for all parties involved. Communities and their members can reap the benefits from a devolution of power provided proper governance of the conservancy is achieved. It has been found that the recognition of being a part of a given conservancy and the sense of ownership of the land it provides is a one of the top 3 benefits reported by community members in areas of successful implementation. Proper governance is based on a high level of participation from the community and democratic traditions. The promotion of equity, equality, and gender balance, along with the mobilization of resources for social purposes and adhesion to the rule of law are determining factors in a conservancies staying power. When devolution of power takes place and communities are empowered there is an increase in horizontal accountability and a reduction in vertical accountability. Horizontal accountability describes a relationship between two or more people of roughly equal power holding the others accountable while vertical accountability refers to superiors such as regional or national governments inferring accountability upon the people. By understanding the community structure before attempting implementation the chances of success greatly increase. Not all communities are the same and in different areas there are different values. With this change in values, understanding what community members would like to receive from taking part in the conservancy is important. Equitable shares of cash dividends, employment opportunities, game meat distribution, educational opportunities, community project funding, etc. all increase a communities support and involvement in a conservancy. Another important factor going forward is the effect that a changing climate will have on Namibia's natural resources. Using climate models it has been reported that over the 20 years from 2007-2027,due to the impact of climate change on its natural resources that Namibia could endure annual losses of close to 6% of their gross national product (GDP). Climate models also predicted that if we continue a business as usual approach in global emissions that by 2080 Namibia's temperatures may increase by approximately 3°C and rainfall could decrease by 5% to 20%. Acting proactively to these possible outcomes is in the interest of the Namibian people and their resources. ↑ Davies, G. and Brown, D. (2008). Bushmeat and Livelihoods. New York, NY: John Wiley & Sons. ↑ 2004. Community Based Natural Resource Managment in Namibia - An Undeniable Success. Conservation and the Environment in Namibia 1. ↑ Bollig, M. and Schwieger, D. (2014). Fragmentation, Cooperation and Power: Institutional Dynamics in Natural Resource Governance in North-Western Namibia. Human Ecology, 42(2), 167-188. ↑ 7.07.1 Vette M, Kashululu R-M, Hebinck P (2012) Conservancies in Namibia: a discourse in action. In: Arts B, Bommel S, RosTonen M, Verschoor G (eds) Forest-people interfaces. Wageningen Academic Publishers. ↑ 12.012.1 Suich, H. (2009) The livelihood impacts of the Namibian community based natural resource management programme: a meta-synthesis. Environmental Conservation, 37(1), 45. ↑ 15.015.1 Bandyopadhyay, H; Humavindu, N; Shyamsundar, P; Wang, L. 2004. Do Households Gain from Community-based Natural Resource Management? An Evaluation of Community Conservancies in Namibia. Environment Department, World Bank, 1. ↑ Muyengwa, S. (2015). Determinants of Individual Level Satisfaction with Community Based Natural Resources Management: A Case of Five Communities in Namibia. Environments, 2(4), pp.608-623.